The Pentagon is preparing an array of military options for striking Iran if hard-hitting diplomatic and economic sanctions fail to persuade Tehran to drop its nuclear ambitions, Defense Secretary Leon Panetta told National Journal in an interview Thursday. The Pentagon chief said that such planning had been underway “for a long time,” a reflection of the Obama administration’s mounting concern over Iran’s continued progress towards a nuclear weapon. 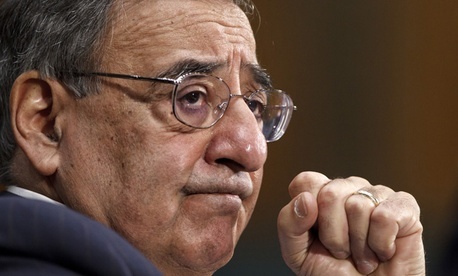 In the interview, Panetta said that he didn’t believe Israeli leaders had made up their minds about whether to order a high-risk raid against Iran’s nuclear facilities. Panetta, President Obama and an array of other senior U.S. military and civilian officials have counseled Israel to give the sanctions more time to work before resorting to military force. They’ve also warned that an attack would set Iran’s nuclear program back only by a few years, a high price to pay for the inevitably violent Iranian retaliation likely to follow. Panetta said in the interview that an unilateral Israeli strike against Iran would be less effective than one conducted by the U.S., which has a significantly larger air force and an array of advanced weapons which are more powerful than any possessed by the Jewish state. An American strike doesn’t appear imminent; Panetta and Obama have said that all options are on the table when it comes to ending Iran’s nuclear push, but the administration has made clear that it prefers to use diplomatic and economic pressure against Iran instead of resorting to military force. “If they decided to do it there’s no question that it would have an impact, but I think it’s also clear that if the United States did it we would have a hell of a bigger impact,” Panetta said in the interview. The comments came one day after Panetta told the Senate Armed Services Committee that the U.S. was reviewing “possible military options” for an armed intervention into Syria, underscoring the real possibility that Washington could soon find itself embroiled in a pair of new -- and risky -- Mideast conflicts. Asked in Thursday’s interview if the Pentagon was conducting similar planning for strikes on Iran, Panetta didn’t hesitate. “Absolutely,” he said. The Defense chief stressed that the administration didn’t simply believe that Iran’s nuclear push posed a threat to Israel. Washington, he said, also saw Iran’s efforts as a direct threat to the U.S.
Panetta’s remarks echoed his tough talk on Iran earlier this week. Speaking to a powerful pro-Israel lobby Tuesday, Panetta said “if all else fails, we will act” to prevent Iran from obtaining nuclear weapons. In his remarks to the American Israel Public Affairs Committee, Panetta said Obama’s new budget requests $3.1 billion in security assistance to Israel, a sharp increase over the $2.5 billion provided in 2009. He also noted that the administration had committed more than $650 million in U.S. funding for Israeli missile defense, double the Bush administration’s pledge of $320 million over the same period. Panetta didn’t mention Iran in those remarks, but his concern about Iran came through loud and clear. In today’s interview, they came through even clearer.